Chocolate poodles are know as brown in the poodle breed. Their coats may show some variation in color, especially darker feathering on their ears and tipping on their ruffs. This is not a fault according to AKC breed standards. Brown poodles should have liver-colored noses, eye-rims and lips, with dark toenails and dark amber eyes. 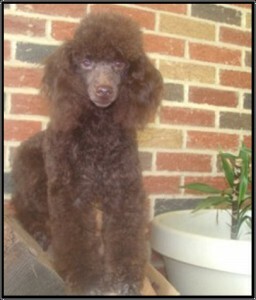 A puppy that is truly home raised, as our are at Homestead Poodles, will be fully socialized by the time it comes to you. Our puppies are accustomed to being around children, neighbors, other dogs and cats, so they exhibit none of the shyness that other poodles can display. These are happy, good-natured pups, full of fun and frolic. They are truly ready to become a member of your family. Selecting your pup isn’t an easy job to do, particularly when you are confronted with an armful of wriggling chocolate kisses. How do you know which one is the right puppy for you? Often people say that you should let the puppy choose you, but that can result in a quieter, gentler puppy being overlooked. The most outgoing puppy may have more energy than you will be able to handle once you get him home. Often the best puppy is one in the middle of the temperament range, neither too bold nor too shy.